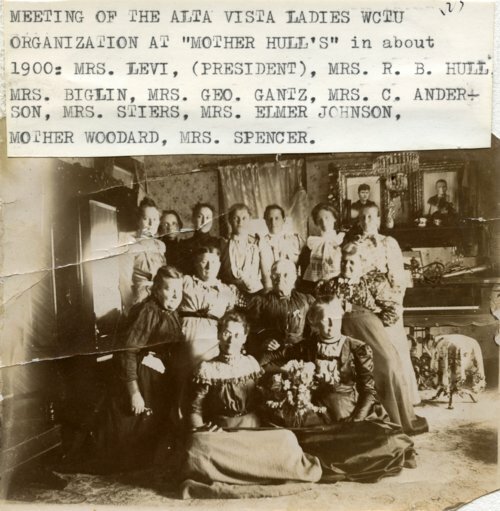 Photograph showing a group of women belonging to the Alta Vista chapter of the Woman's Christian Temperance Union meeting inside "Mother Hull's" residence. Identified in this photo are Mrs. Levi (President), Mrs. R. B. Hull, Mrs. Biglin, Mrs. Geo. Ganz, Mrs. C. Anderson, Mrs. Stiers, Mrs. Elmer Johnson, Mother Woodard, and Mrs. Spencer.